Daniel Suárez, driver of the No. 19 Toyota Camry for Joe Gibbs Racing, visited Richmond Raceway in advance of the Toyota Spring Race Weekend under the lights on April 20-21. From meeting the Governor of Virginia to hosting a luncheon with local business leaders to touring Richmond Raceway Reimagined (Reimagined), Suárez shared the story of his rise in motorsports throughout the greater Richmond region. The day began with Suárez and Richmond President Dennis Bickmeier meeting Virginia Governor Ralph Northam, who is a noted fan of NASCAR and rebuilds classic cars. 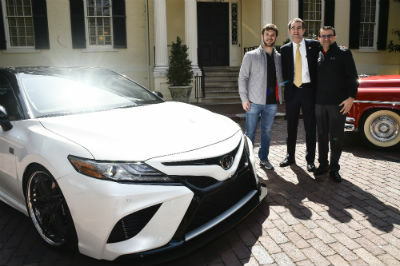 Suárez brought along his modified 2018 Toyota Camry that debuted at Specialty Equipment Market Association Show to the Governor’s Mansion. Governor Northam shared a classic car he rebuilt and opened the hood to compare the engines of the cars. The Governor, Suárez, and Bickmeier also met with local media to discuss motorsports, classic cars, and the upcoming Toyota Spring Race Weekend. To download broll and images from Daniel Suárez day in Richmond, click here. The track partnered with the Virginia Hispanic Chamber of Commerce (VAHCC) for a luncheon with Virginia business leaders and track sponsors in the TORQUE Club. Michel Zajur, CEO of the VAHCC, opened the program welcoming visitors from across the state for the luncheon. Bickmeier introduced Suárez who shared the story of his rise in NASCAR to the Monster Energy Series. The luncheon concluded with a question and answer session with attendees followed by photos and autographs with Suárez and fans. Following the luncheon, Bickmeier and Suárez led a Hard Hat Media Tour of Richmond Raceway Reimagined, the track’s $30 million infield redevelopment project. The group made the first walk through the new expanded pedestrian tunnel installed near Turn 1 to enter the modernized Richmond infield. Suárez also became the first driver to walk through the new Monster Energy Series garages. The new garages will be open for competitors for the Toyota Spring Race Weekend, but will not open for fans until Richmond’s Fall Race Weekend, presented by Who’s Your Driver. In the new modernized infield, Suárez met with the members of Team Racing Virginia made up of Chase Burrow, Chase Butler, Macy Causey, Grayson Cullather, Zach Lightfoot, and Timmy “Mini” Tyrell. The motorsports athletes were selected by the Racing Virginia platform to help grow racing in the state at the grassroots level. The young racers asked Suárez about his rise to NASCAR’s premier series as well as advice on becoming a better competitor. Suárez also met with members of Richmond’s Fan Advisory Board (FAB) and Youth Fan Advisory Board. The FAB is a group of loyal fans who provide feedback and new ideas to aid in the growth and development of Richmond. The FAB members in attendance visited with Suárez about ways the track can continue to grow to exceed expectations by delivering the ultimate fan experience. The day concluded with Suárez and Bickmeier in a one-on-one showdown in the Richmond Raceway Simulator. They were able to get behind the wheel in Richmond’s state of the art two-seat, in-car driving simulator to drive Richmond’s famed ¾-mile D-shaped oval. The Richmond Simulator is powered by iRacing, the world’s premier motorsports racing simulation platform. The race was no contest as Suárez took the checkered flag at America’s Premier Short Track.